Smart Contracts make the world a lot easier. This isn’t simply a claim, it is a fact, and we will prove it. Say hello to the Airdrop Smart Contract from MyWish. The Airdrop Smart Contract was inspired by a complex process of token distribution used during a Bounty Campaign. To date, however, there have been no effective solutions to reward Bounty Hunters (the term commonly used in reference to active participants of any Bounty Campaign). The rewarding process consumed a lot of time because one would have to send tokens to thousands of participants individually. To input a wallet addresses is not a simple process, it demands a lot of concentration in order to not make mistakes and deny your participants their reward. From now on, MyWish’s Airdrop Smart Contract will give any Bounty Campaign the opportunity to automate the rewarding process. The main benefit can be stated in two words: saving time. For example, you are able to distribute tokens to 100 different addresses in less than five-minutes. Excellent! This Airdrop Contract could be also used for pre-ICO period as an introduction part. Then it’s logical to implement that to distribute tokens to participants. Additionally, clients of the Airdrop Smart Contract will save up to 30% of their crypto-assessments. As you may well know, in order to execute a transaction you have to use gas. We combine dozens of transactions into one in order to help you make more profit. Please note that the MyWish Platform does not store your tokens. You can call your Airdrop Smart Contract at any time and withdraw your investments. We invite you to take a look at our test version of the Airdrop Smart Contract and see how practical and easy your life could be. 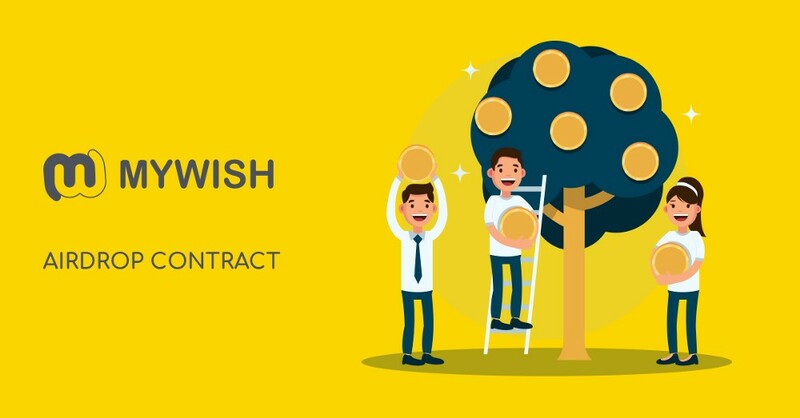 https://contracts.mywish.io/create. Free of charge! We always welcome and are eager to receive your feedback.